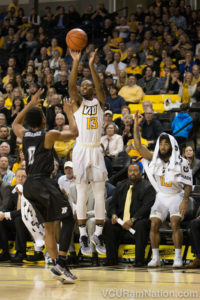 After muscling it out on Tuesday night in Lynchburg against Liberty, the Rams were back at the Siegel Center Friday night as they hosted the Binghamton Bearcats out of the America East Conference. It was not the hard fought battle from earlier in the week as the Rams would take the win handily, 81-41. VCU’s defense was the thorn in Binghamton’s side tonight as they Rams held the Bearcats to shooting just 28% on the night. VCU capitalized with 22 points from 18 forced turnovers by the Bearcats. The night saw 4 Rams score in double digits. Freshman De’Riante Jenkins led them all with 14 points. Jenkins would grab 10 rebounds, earning him his first collegiate double-double. Senior JeQuan Lewis scored 12 on the night. Junior Johnny Williams, once again, showed the VCU faithful that they will be in good hands next year as he dropped in 8 points and 5 assists. Senior Jordan Burgess once again had an impactful night with 10 point and 5 rebounds. VCU moves to 3-0 on the season and will travel to the Bahamas to play Baylor on Wednesday, November 23rd at 2:30pm as part of the Battle 4 Atlantis tournament. The game will air on ESPN2. I’m having trouble with your website. I log in successfully and then go to the INSIDER content. Then I am told to log in. Am I doing something wrong? Having same problem as cooktq. What do I need to do?